Size: 7.8" x 7.5" x 2.5"
Introduced in parallel with the successful TI-5040 this non-printing desktop calculator had a rather long lifespan of roughly 5 years. A similar model with a 12 digits display was introduced one year later with the TI-5200. The TI-5100 was manufactured both in USA and Netherlands. The European model we discovered uses different electronics. The TMS1073 of the famous TMS1000 Microcomputer family calculator chip inside the TI-5100 was later used with the Toshiba BC-1015. The differences in the weight result from an "optional" metal plate inside the calculators to give a more stable feedback of the keyboard entries. About 8 years later we got the TI-5100 II with a much sleeker housing. 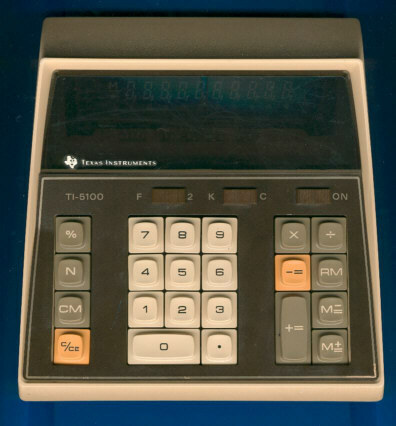 The TI-5100 is featured in the Texas Instruments Deutschland GmbH leaflet ER-1976 dated 1976. An attractive, functional calculator that means business. This versatile, quality calculator can increase calculating efficiency in the office or at home with silent, effortless operation. Adds, subtracts, multiplies, divides and features a memory to store and recall numbers. Display shows M when a number is in memory. Overflow is indicated by an arrow at the left of the display. Calculate percentages, taxes and discounts. An item count key for simplified inventory and calculation of averages. Decimal selector switch positions decimal at full floating or presets at two places. Large 10-digit green vacuum fluorescent display (with comma) for easy readability.